Android optimized event bus that simplifies communication between Activities, Fragments, Threads, Services, etc. Less code, better quality. Otto is an event bus designed to decouple different parts of your app while still allowing them to communicate efficiently. Forked from Guava, Otto adds functionality to an already refined event bus as well as specializing it to the Android platform. This is an event bus designed to allowing your application to communicate efficiently. 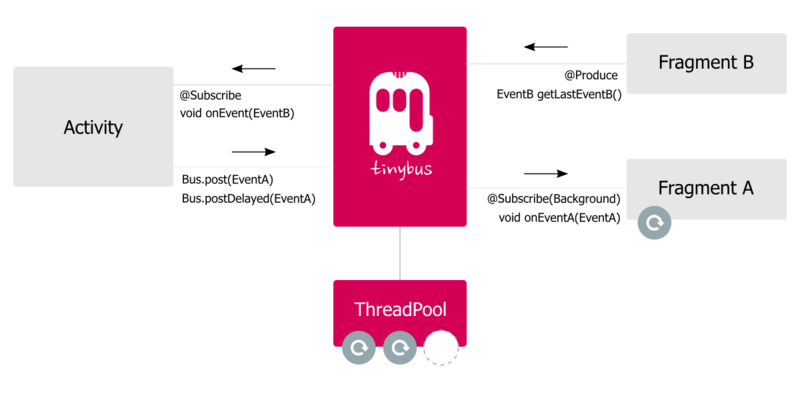 An eventbus library for android, simplifies communication between Activities, Fragments, Threads, Services, etc. HermesEventBus is a library for using EventBus between processes, useful in IPC or plugin-in development. It has the same APIs as EventBus and easy to use. A lightweight and simple event bus for Android. NYBus - A pub-sub library for Android and Java applications. RxJava2 EventBus that supports pausing and resuming. This way, you can achieve that the bus is queueing events while it is paused and emitting events while it is resumed which is a nice way to enforce that events are only observed, when for example your activity is resumed and your views are accessible. This is a simple Rx Event Bus implementation using Kotlin. Android reactive event bus that simplifies communication between Presenters, Activities, Fragments, Threads, Services, etc. RX based bus with lifecycle based queuing support. Simple events bus (publish–subscribe) implementation based on regular Android BroadcastReceivers mechanism. Simpler to use and faster alternative to LocalBroadcastManager. MicroBus is inspired by OttoBus, and it has its stronger and weaker points. Event bus for Android with fine-grained thread control. Faster than Intents and easier than AIDLs. IPC EventBus is an Android library for sending events between processes or different apps. Super lightweight (14 LOC) and minimalistic (post(), subscribe(), unsubscribe()) EventBus written with idiomatic Kotlin and RxJava 2. A simple way to bind and exchange messages between activities and services. The Universal Event Bus is an event dispatcher architecture which help you to use most common event bus implementation as Otto in a structured mode. itstimetoact - it's an android library, inspired by 'once', that can help you with planning events in your awesome application. The data binding model and tools that google introduced leaves out something, namely how to updated when user changes text, etc. Seems to me that it might call for using some of the RXJava and RxAndroid Observables sugar to handle those cases and make the event bus more streamlined and handle more use cases. This library helps android developers to implement something like iOS key value observer pattern (KVO). Type-safe and thread-safe, one-to-many event bus in Java, optimized for speed and low-garbage on Android. Simple Local Broadcast(s) on top of android LocalBroadcastManager. Library for Event bus - implemented using RxJava2 in Android.